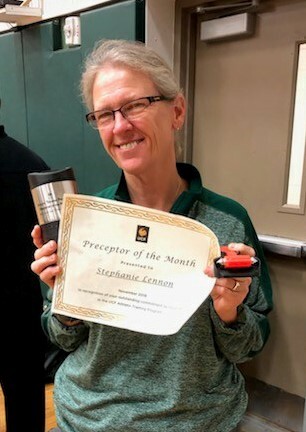 Congratulations, Stephanie Lennon, for earning the UCF Athletic Training Program’s Preceptor of the Month award for November! Lennon is head athletic trainer for Oak Ridge High School. Lennon was nominated for the award by James Masters, athletic trainer for Jones High School in Orlando. They met when he was her student at Oak Ridge High School (class of ’95). It was then that she introduced him to the athletic training profession. After pursuing athletic training as a career, Masters earned his bachelor’s degree and worked alongside Lennon at Oak Ridge. He eventually took a position with Jones High School, but he stays in regular contact with Lennon. Masters says Lennon exemplifies what it means to be fully engaged in the athletic training profession. Not only is Lennon the school athletic trainer, she also teaches in the high school and serves as an adjunct for UCF and a preceptor for current athletic training students. Lennon is an avid learner, attending CEU events and conferences whenever possible to increase her knowledge and skills. She has served on national and regional athletic training committees including the Athletic Trainers’ Association of Florida, Southeast Athletic Trainers’ Association and National Athletic Trainers’ Association. Most importantly, Lennon instills in her students that they should never stop learning, regardless of how many years they are in the profession. Lennon entered the profession 33 years ago, and she shares her vast experience and love of teaching to supplement student learning. She is always available for UCF athletic training students to practice and test competencies, as well as to work with them to improve their patient interaction and care with role-playing. According to Masters, Lennon can deal some “tough love,” but she has a heart of gold and her goal is to prepare students to be the best athletic trainers they can be. Lennon also makes time for previous students, Masters included, when they contact her for advice and counseling. Her overall love for the profession shows in everything she does. Zya’Nel Moorehead-McKie, a current senior in the UCF Athletic Training Program, says Lennon brings class, humor, patience and creativity to the athletic training facility, and she always provides hands-on opportunities that better her as an athletic training student. Lennon is admired by colleagues, students, athletes and interns.